Can you imagine if the Buddhists had discovered America before the Catholics? The native Americans would still have keeled over by the millions as a result of accidental germ warfare but the central plains might yet be teeming with buffalo and every street corner wouldn't be choked by businesses offering a new and novel menu of murder on a stick accompanied by a big cup of ice-cold sugar-water. Surely a similar result if the white man had never invented the sextant and stuck to internecine, religion-powered genocide with its European, African, and Asian brethren. Happy 4th of Jooly, ladies and germs! 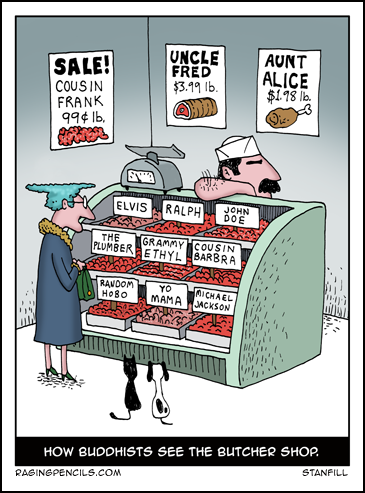 How Buddhists see the butcher shop. Little old lady in butcher shop that features names of dead people. Cousin Frank, Uncle Fred, Aunt Alice, Elvis, Ralph, John Doe, The PLumberm Grammy Ethyl, Barbra, Random Hobo, Yo Mama, Michael Jackson.